If you grow your own food, you will at some point experience the garden producing at a faster rate than you can consume it. This phenomena, is most commonly known as “HOLY-COW-I-CAN’T-KEEP-UP syndrome” and is not unusual. In fact, it is preciously why so many of us love to preserve food. We want to capture our garden flavors so they don’t go to waste. But you don’t have to “can” your food to preserve it. There are other methods of food preservation. And freezing is one of them. 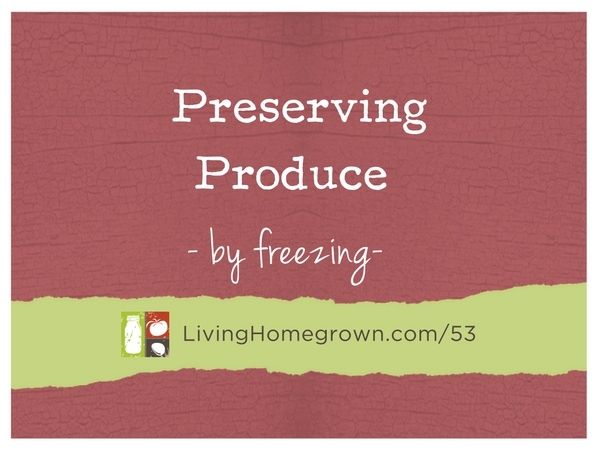 Freezing is fast, easy and in most cases preserves more of the nutrients than canning does. What I love about freezing is that you don’t need any special equipment (other than a freezer, of course). It’s so simple! And that simplicity equates to less time in the kitchen than water bath canning or pressure canning. In other words, it is simple and FAST. Here some of the finer points to freezing produce. There are several options out there when it comes to freezer containers. First, you can freeze your produce in plastic baggies. The downside to this is that some baggies contain BPA which can be a concern when food is contact with plastic for long periods of time. You can look for BPA-free brands of plastic baggies. But that does not guarantee that it doesn’t have other harmful chemicals. I do use BPA-free baggies occasionally, but they are not my first choice. I prefer to use glass containers. Which ones do I like best? Canning jars! Modern canning jars work great for freezing and you can use the standard 2-piece lid/ring to seal the jar. (Avoid using vintage jars because they are not meant to withstand extreme hot and cold temperatures.) Many of the newer jars even have a freezer line marked on the jar as the maximum amount to fill. The down side of glass it that it does not conform to the odd shapes within the freezer area and they can break if you overfill them. But if treated carefully, they work very well as freezer containers. When using glass for freezing, it is especially important that you leave adequate headspace (the air gap between the top of the food and the top of the jar). This is because all food expands when it freezes. But liquid REALLY expands. If you don’t leave adequate space for that expansion, the glass will crack and break. Dry Pack (just fruit/vegetables with no liquid): Leave at least a 1/2 inch headspace for both pint and quart size jars. Liquid Pack (fruit and liquid mixed together): For wide-mouth jars, leave a 1/2 inch for pint and 1 inch for quart. For narrow-top jars with a neck, leave 3/4 inch for pint and 1 1/2 inch for quart. For All Liquid Pack (all juice or all liquid): Leave at least 1 1/2 inch space for all size jars. If you are simply freezing your berries to use later in a jam or jelly, you can just measure and freeze them. They will form a solid lump, but as long as they were pre-measured, you can defrost and use them in your recipe without a problem. However, if you want to be able to pull out a handful of berries at a time for smoothies or pancakes, etc., then you should flash freeze the berries before packing them into containers. Doing so will prevent the berries from sticking together in a giant lump. Flash freezing is just a fancy name for freezing the berries first as individuals before placing them in the container. Place your clean, dry berries on cookie sheets and place them in the freezer for several hours or until they are frozen solid. Then measure and place in your freezer safe containers as you normally would. Although many fruits are pretty straight forward when it comes to freezing. Other fruits have different quirks or recommendations for getting the best success. And knowing ahead of time what you want to use the fruit for can make a big difference in how you treat the fruit before freezing. For example: If you are just going to cook the fruit for jam or juice the fruit for jelly, then you can usually freeze it without any special steps. But if you want that fruit to have a more solid texture when it is defrosted (not softened), they you need to treat it to deactivate the enzymes that cause browning and softening. The treatment usually involves adding ascorbic acid* to the process. Ascorbic acid is just a powdered form of Vitamin C and can be found where ever you buy your canning supplies. Other times, a sugar syrup is called out. But if you are trying to avoid added sugar, ascorbic acid would be a better choice. To help you determine which tips work with your particular fruit, you can check this chart. All vegetables have an enzyme that will speed up the breakdown process of that vegetable. This enzyme will cause the vegetable to go soft and mushy while frozen. You are not cooking the vegetable. You are only deactivating the enzyme. So you only need to blanch for a few minutes and then you plunge the food into ice water to prevent cooking. Each vegetable has its own blanching time requirement. You can look up the times needed for your vegetable by going here. Tomatoes are special…in a good way! Since they contain so much water, they will defrost in a softened state no matter what you do with them. So while you can blanch and peel your tomatoes before freezing (and many people do), I prefer to just freeze them without peeling or blanching. I freeze them the same way that I freeze my berries. I flash freeze them and store them in BPA-free baggies. Later, when I need a tomato for chili, stew or soup, I pull out what I need and let it defrost on the countertop in a bowl (to catch the juice). Once defrosted, the skin slips right off and it is a simple matter to core the tomato using a spoon. The tomato will have the consistency and texture of a stewed tomato but will still retain all of the flavor of a fresh tomato. You absolutely can slice, blanch and freeze zucchini and it holds up well to be used later in different dishes. But if you want to use that zucchini in the grated state to add to zucchini bread, muffins or other baked goods, then you can skip the blanching process. Remember, skipping the blanching step means that the defrosted food will be soft. But if you are using the zucchini in baked goods, you don’t care if it is soft! So, I take the zucchini designated for baked goods and I grate it into 1 cup measurements. Then I freeze it just like that. When I want to make zucchini bread, I just defrost what I need and mix up my next batch of baked goods. Easy! I’m loving your podcasts. I can listen while at work!! Multitasking at it’s finest. Loving all the freezing tips. I’m enjoying the Canning Academy immensely but I know that I will also be freezing some of my bounty this year. Thanks so much for sharing all of your knowledge. Thanks so much Renee! I’m so glad you are enjoying the Canning course! I have always (years) frozen my berries by washing and drying and wrapping in wax paper (1 layer). Saw it on a cooking show. Berries do not get freezer burn and do not get soggy. Have you heard if this keeps nutrients safe or is this not safe? I read and listened to your explanation of freezing tomatoes.I understand it with large tomatoes but what about cherry tomatoes. Can u do the same procedure ?Will the skin just peel off as well as the core?Come to think of it they really don’t have a core just a end stem.Can u just peel off the skin and will the stem come off easily?If u have a lot of cherry tomatoes and your husband does not care for roasted or dried tomatoes how else can you preserve your cherry tomatoes?If u want to use them in chilli and / or sauce(I know larger Roma tomatoes r better for this) could u cut them in half to remove the stem and freeze them after they r cut in half and then after u defrost them just add the whole little tomatoes to your food processor with out removing the skin and just purée them and then cook them with the skin on.I have tons of cherry tomatoes and need to know as soon as possible before they get bad . How long do they last after being harvested? Also is it true it is better to keep them out of your refrigerator , they taste better I heard?Would storing them in the refrigerator prolong the storage life? Another comment, u said u need to buy BPA plastic free bags from a special store I called Zip Lock about my freezer bags bought from SAMs or HEB and even if the box does not say they r free of BPA they said along with Rubbermaid containers(I called them also) that a law was passed and all of the ziplock bags and Rubbermaid containers have to be made free of BPA. For comment made on freezing cherry tomatoes please e-mail me your advice , thank u , forgot to click on this button until after I submitted the questions. Just came across your site, and your podcast is amazing!